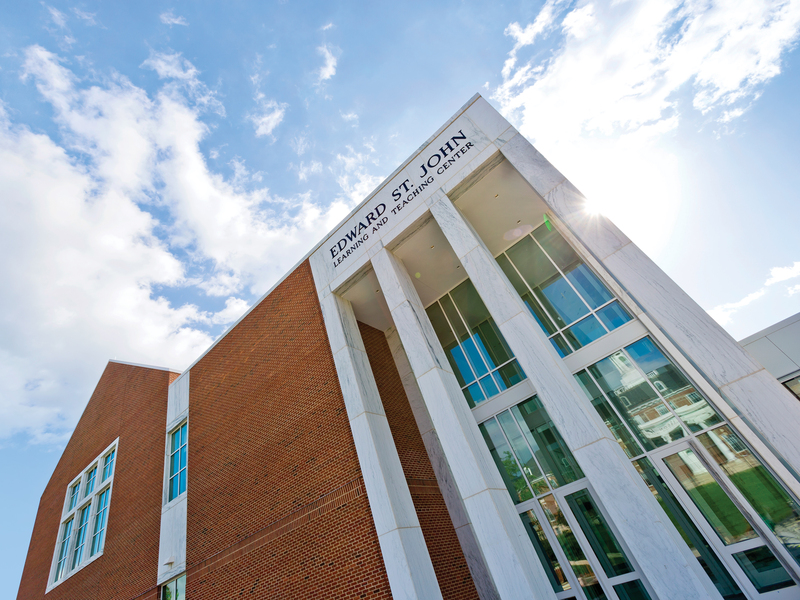 The Edward St. John Learning and Teaching Center is a beacon for progress. From its cornerstone—the first new one laid on McKeldin Mall in 50 years—to its two green roofs, the building provides an atmosphere dedicated to collaboration and exploration. It also shines a welcome spotlight on chemistry. 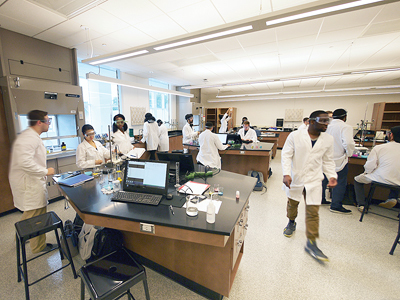 A new generation of students will learn chemistry here, in laboratories outfitted with the latest technology and spaces that encourage their curiosity and burgeoning professional interests. The brick-and-glass building is named for Edward St. John, B.S. ’61, electrical engineering, a real estate developer and philanthropist who launched the project with a $10 million leadership gift. Inside the beautiful structure that opened in May, a 187,000 square-foot floor plan comes alive with well-designed discussion spaces and rooms dedicated to active and group learning. Nine chemistry labs serve some 4,000 undergraduate students—most of them freshmen and sophomores—each year. These workspaces are meant to inspire multidisciplinary projects and promote interest in modern subjects including “green” chemistry. The labs are stocked with brand new equipment including refrigerated microcentrifuges to separate and concentrate biomolecules, sensitive fluorimeters to detect chemical complexes, spectrophotometers for quantitative analysis of chemical samples, and new analytical balances. 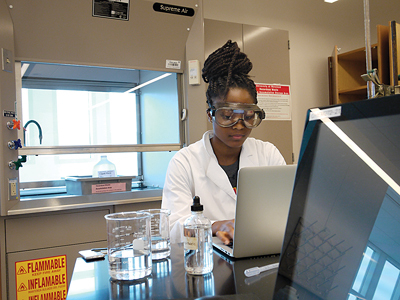 On the first floor, students study biochemistry using DNA and other biological samples and focus on measurement-intensive projects that train them in precise data collection and data management methods. 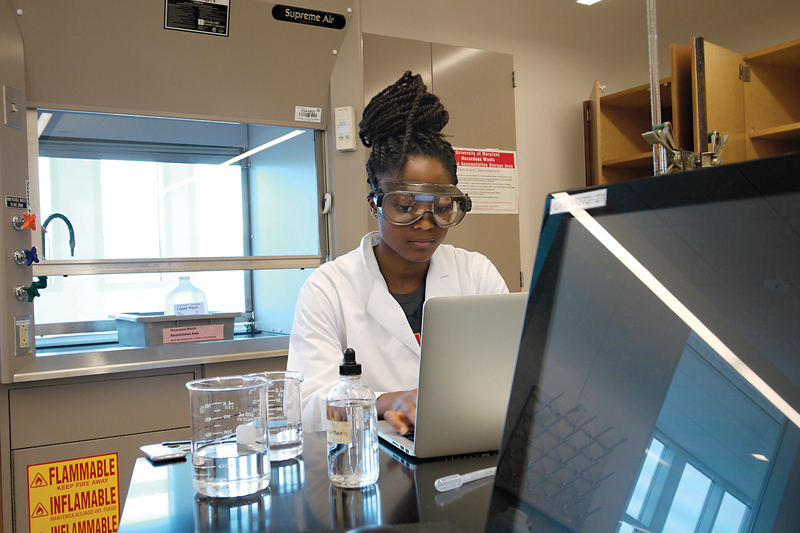 Space on the second floor is devoted to introductory lab courses that ground students as they begin work in chemistry, as well as bioanalysis lab courses. 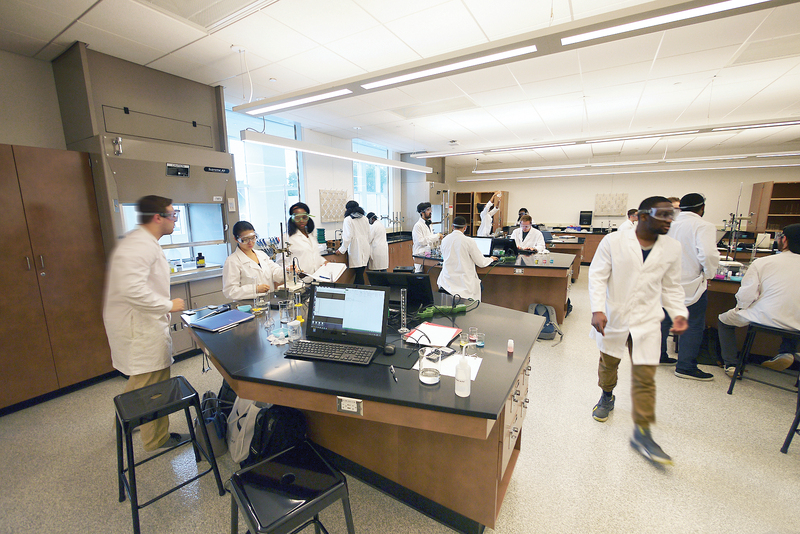 University of Maryland alumni have joined the mission to advance chemistry education in the Edward St. John Learning and Teaching Center, pledging support to specific labs and classrooms for the foreseeable future. Their vision for maintaining this state-of-the-art space will have long-term impacts for current and future Terps. Having set up a lab for the U.S. Bureau of Immigration and Customs Enforcement, Douglas Kent Shaffer, B.S. ’72, chemistry, knows how quickly small expenses add to a department’s bottom line. That’s why he endowed a new fund that allows staff to replace consumables and outdated lab equipment as needed. It’s the second time Shaffer has made such a gift to the University of Maryland. A career chemist, Shaffer has worked with big names in the biomedical, materials science and law enforcement fields. He has analyzed asbestos, toxic biofilms and forensic crime-scene evidence ranging from gunshot residue to inks and papers. Throughout his career, he turned to the techniques he mastered while an undergraduate at Maryland. He fondly remembers studying with the likes of Kenneth Henery-Logan—a professor in the department from 1960 until 1990 who had worked on the first team to synthesize penicillin. “The professors at Maryland didn’t just teach us chemistry, they taught us how to solve problems,” Shaffer said. 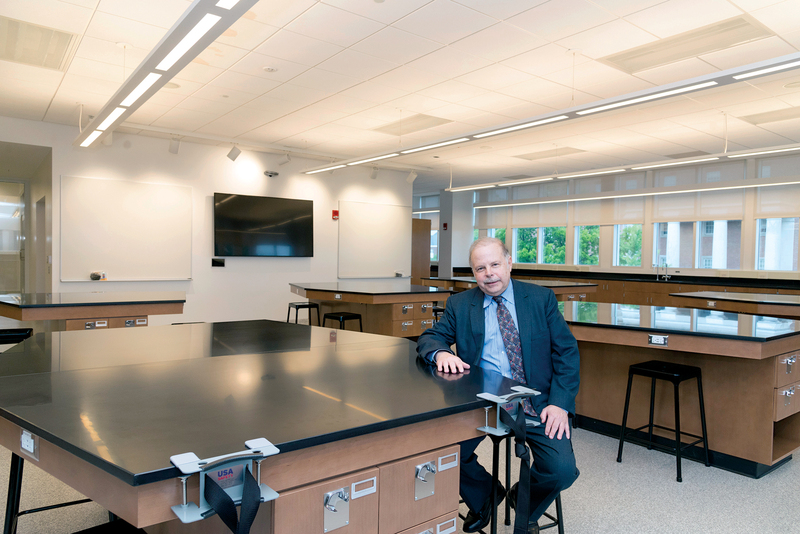 He believes the Edward St. John Learning and Teaching Center’s focus on collaboration will give today’s students the same opportunities to explore their passions for science. Gary Christian, M.S. 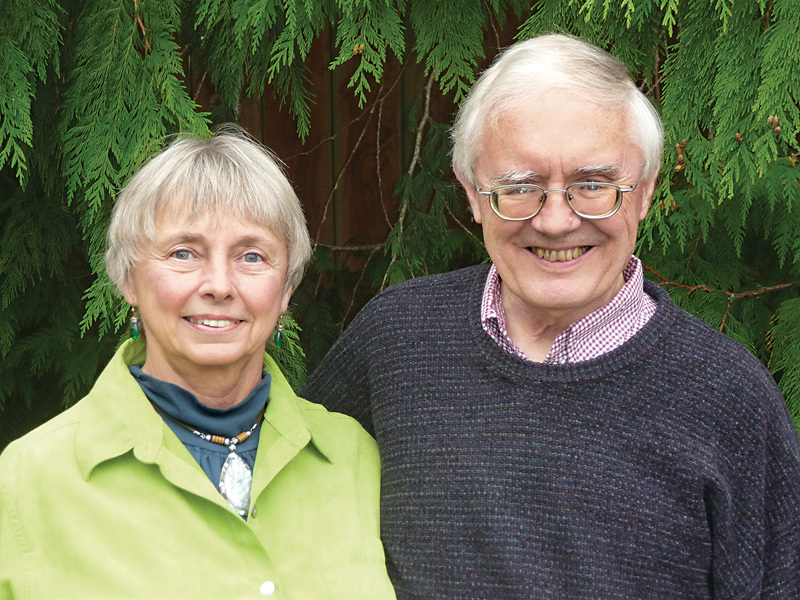 ’62, Ph.D. ’64, chemistry, and Sue Christian, B.A. ’62, English, met as students at the University of Maryland. Together, they went on to develop technologies in analytical chemistry and were recognized extensively for their work. Among the couple’s accolades, Gary received the American Chemical Society’s Award in Analytical Chemistry. 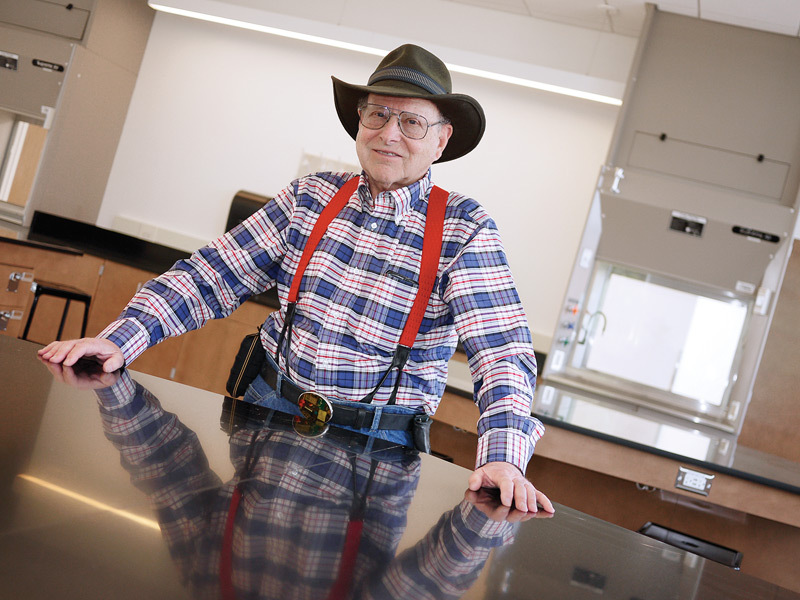 Gary enjoyed a successful career at the University of Washington, where he remains a professor emeritus of chemistry. But it almost wasn’t to be. He came to UMD to pursue a career as a high school teacher. 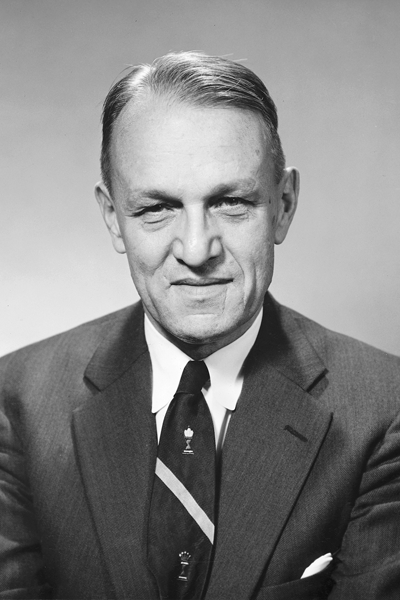 Chemistry Professor William Purdy, the man overseeing his research, convinced him to stay on for a doctorate. “Education changed our lives, and we try to share that opportunity as broadly as we can,” Gary said. The Christians, who previously created a graduate award in the Department of Chemistry and Biochemistry, wanted to support the new building because of its analytical capabilities. They broadened their giving to endow an operational fund to replace equipment as it becomes obsolete. “The technology for laboratory equipment such as spectrometers and analytical balances keeps improving, and the equipment is so heavily utilized that these items have a useful lifetime of five to seven years,” explained Reutt-Robey. The equipment fund will also allow instructors to introduce new energy- or biochemistry-themed experiments that might require additional tools such as electrochemistry meters or polarimeters. “We recognize that this gift has the potential of being a benefit to students in perpetuity,” Gary said. Jon Graff, B.S. 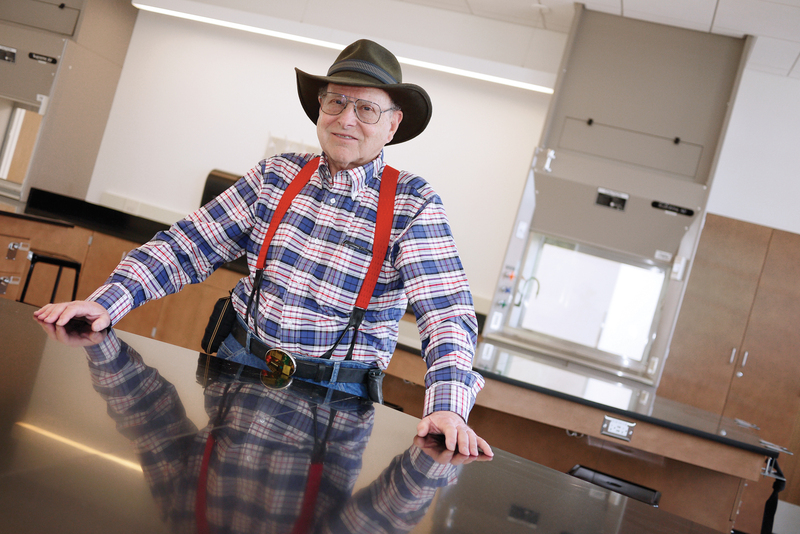 ’66, Ph.D. ’71, chemistry, funded a teaching lab in recognition of the role research played in his education and career. Graff started his career as a biochemistry, virology and cell biology researcher, authoring 17 scientific papers. Later, he worked with computer technology, developing secure digital communications as a cryptographic architect. In his second career, he authored additional papers and a book on cryptography and e-commerce, designed secure communication systems for Fortune 500 companies, and was awarded a patent in digital communications. “I have pursued a life of acquiring knowledge, enjoying learning new things and learning how we know those things,” he said. He traces much of his curiosity and success to his days at Maryland. He said his gift is given in gratitude for the assistance of UMD’s chemistry and microbiology departments and the Bureau of Biologics at the National Institutes of Health in Bethesda, Maryland. All three helped facilitate research for his dissertation. 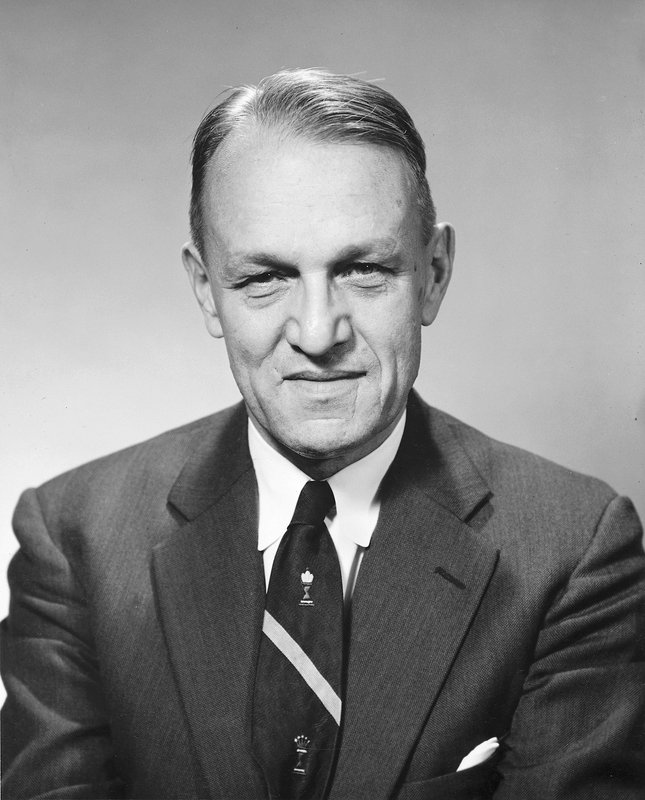 Drake created the Institute for Molecular Physics at UMD and served as department chair from 1940 until his death in 1959. He was recognized by colleagues and students as a tremendous mentor, researcher and educator. Drake oversaw the department during dramatic ups and downs. Declining enrollment during World War II gave way to a post-war spike that sent the number of university students soaring from 2,235 in 1945 to more than 13,000 in 1950. The chemistry faculty more than doubled during Drake’s tenure. During that time, the department outgrew its home in Sylvester Hall and moved into three temporary buildings. The first two wings of the Chemistry Building were finished by 1952, and lecture halls that opened there in 1960 were named for Drake. 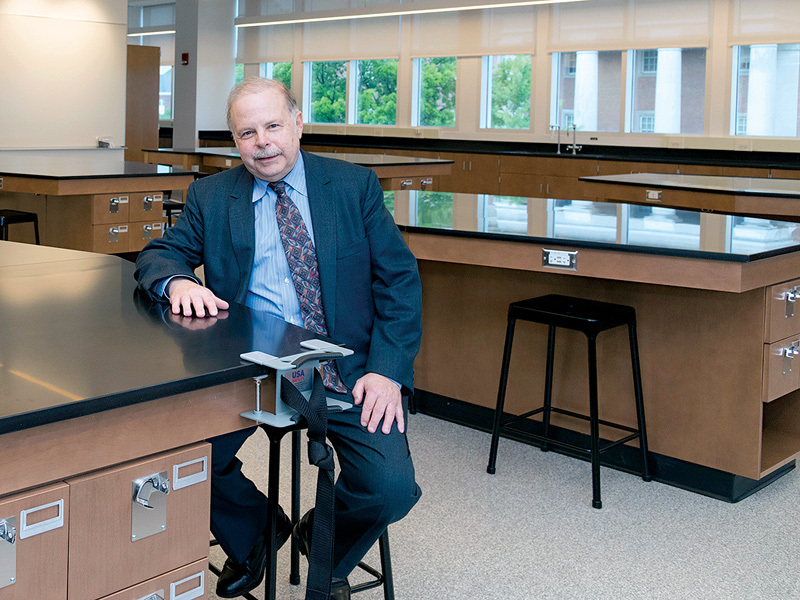 Now, his name graces an Edward St. John Learning and Teaching Center laboratory built for the next generation. Those words greet all who enter the third-floor outdoor classroom, a green roof where students will be able to investigate chemistry’s role in, and influence on, organic materials, agriculture and architectural design. What they’ll be able to study—and the solutions they can envision for today’s pressing environmental questions—is limited less by budget than by the bounds of their own creativity. That’s thanks in part to The Bresler Foundation, which aims to encourage students and faculty to use landscape art, natural features, local plantings, wildflowers and wildlife habitats to create a tranquil environment for the pursuit of academic excellence. “This area in particular is ripe for collaboration,” said Reutt-Robey. Students will be able to test their measurement skills and hypotheses in a real-world setting, seeing how the decisions they make impact what grows and how it fares under varying conditions. “We’re hoping to direct innovative experiments here, to build a better understanding of that research relationship,” Reutt-Robey said. Five laboratories in the Edward St. John Learning and Teaching Center still need support! If you would like to advance chemistry education for Terp students, please contact Andrea Morris at 301-405-4572 or aemorris@umd.edu.